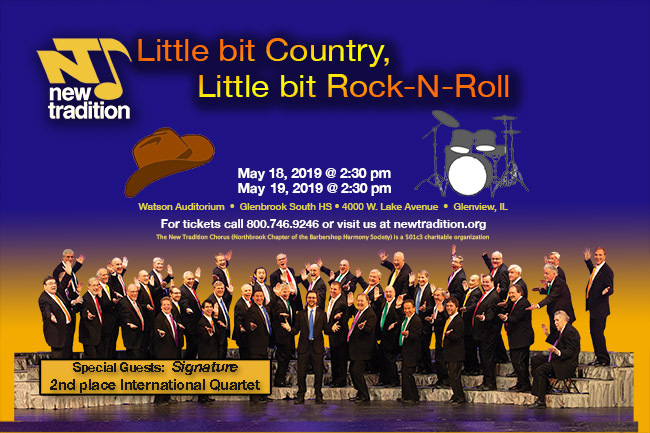 The New Tradition Chorus is an award-winning men’s barbershop chorus located in Northbrook, Illinois. Chartered in 1982, this Illinois District chapter of the Barbershop Harmony Society has a long-standing reputation for delighting audiences through exciting harmonies and memorable performances of songs spanning decades and genres. Through a cappella performances of diverse musical styles, the New Tradition Chorus strives to delight audiences and enrich lives through song. The chorus is committed to helping men who love to sing become the finest performers they can be, both as individuals and as members of an ensemble dedicated to making and sharing great music. We sing at nursing homes, and hospitals as well and organize a youth program (youth in harmony) that we sponsor every year where we work with a high school to educate students in our style of music . Last year we initiated a community 6 week “Free Singing Lesson” program to the which welcomed men as well as women. My cousin, Henry Diettrich (Hank) sang with your choir. I recently visited his wife, Barbara, and we were talking about the choir and I found it on YouTube. Well, the other day I had Pandora on my SmartTV and I heard New Tradition singing Christmas Carols. I said to myself, I have to get a CD. I received one today, America. Love it. Wish I had seen Hank singing when he was alive. Glad you’re enjoying our ‘America’ CD, and we hope it will carry on Hank’s memory in your family. Best wishes! I attended your concert this werkend and was blown away. Have been searching desperately for your recording of “I have Seen the Light”. Can you help me? Sorry for the delayed reply, and thanks for your kind thoughts! At this time, we don’t have a recording of “I Have Seen the Light”, but if you visit one of our November rehearsals we’ll sing it just for you! See you at our Spring Show! The last thing that Dan said at the end of rehearsal on Saturday was “If you put that on the contest stage, I’ll be happy.” The chorus did and he was…and so was everybody else! As the curtain opened, the chorus was greeted with rousing applause, hoots and hollers. Then, the electric performance ignited the crowd! It was a banner day for the “new” New Tradition winning the Most Improved award, the Most Entertaining award and earning the right to represent the Illinois district at International. Congratulations! Hope to see you at the New Tradition Spring Show the first weekend in June 2017! My husband and I just watched your performance on WGN this morning. We thoroughly enjoyed it! You are excellent! Brought tears to my eyes, Proud to be an American is one of my favorites. We live in the Chicago western suburbs. Do you have a schedule of your engagements? Thanks, Matt Owen! Check out our Facebook page, and you can post some of your photos and memories there! The new site looks fantastic! I hope to be singing again with all you guys when I move back to the Chicago area later this year!